Specialist Auction House dealing only with Vintage Radio. Rusbridge's Auctions only handle vintage radios. 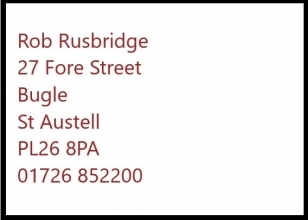 Rusbridge himself has been in the vintage radio business for around forty years, and has around twenty-five years' experience of the arcane art of the wireless auction. We have some of the very best buyers in the country on our Christmas card list, so if you are selling, we can make sure your goods reach your target audience. We offer a complete service to our sellers, at whatever level is required, from simple "enter and sell" to a full clearance, sorting, lotting and selling service. Whatever you need us to do for you, the first step is to make contact. 7th April 2019, Radnage Hall, HP14 4DJ. Near High Wycombe. Sorry, cancelled due to circumstances beyond our control. Still very much going ahead. Accepting entries now. A catalogue will be available nearer the time, you can download it as soon as it's ready. The results for the last sale are downloadable here. Terms of business and an entry form are downloadable here. Entry form continuation sheets are downloadable here. This website was created at absolutely no expense by the proprietor.